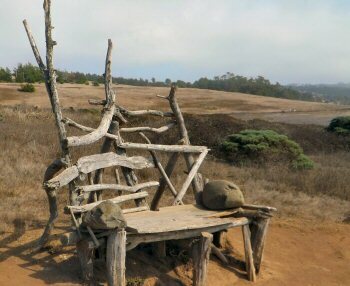 The Fiscalini Ranch Preserve in Cambria is a wonderful 430 acre open space right on the coast. Little known, it is a gem on the Central Coast. 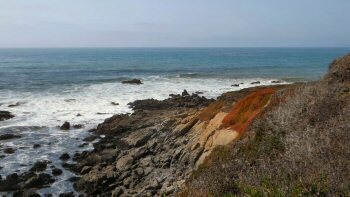 Easy hiking trails afford gorgeous views of unspoiled California coastline. for the Photo of the Week! 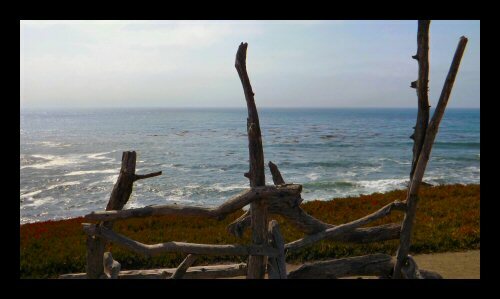 The previous Photo of the Week was taken in Cambria at the Fiscalini Preserve, a 430 acre open space along the coast. Formerly a dairy, it was destined to be developed until the people of the area stepped in and bought the property. The Fiscalini is one of those places here on the Central Coast that you can pass by and never know it's there. If you have driven through this area on Highway 1, you have passed within a few yards of it. I've never seen any signs alerting visitors to its presence either. 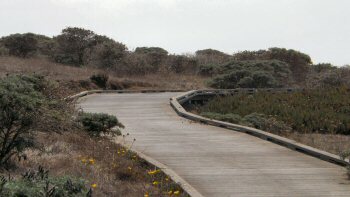 There are great hiking and walking trails, most of them ADA accessible and some of the trails are the same sort of boardwalk found along Cambria's Moonstone Beach. There are two main trails at the Preserve. One is the Bluff Trail, where this bench is found, which skirts the edge of the bluffs overlooking the rocky beach here. The second is the Marine Terrace trail, below the ridgeline at the top of the hill, whose extra height gives wonderful views of the coastline. The Friends of the Fiscalini Ranch Preserve, the group which turned the dream of this open space into reality, have published a trail map which you can access here. The Friends of the Ranch also have a handy street map showing the various entry points to the open space. If you've been to Cambria and traveled along Main Street and then across Highway 1 to Moonstone Beach, you've just missed the Ranch. Instead of turning right onto Moonstone Beach Drive, keep going straight along Windsor Blvd. which will bring you to the north entrance to Fiscalini Preserve. The Preserve is open, free of charge, 365 days a year from dawn to dusk. There are also docent led walks here monthly focusing on different highlights of the Ranch - information available here. Like most of the places here in Central California, what you will see is dependent upon the season - wet season or dry season. From November through April, the hillsides here will be green and lush if the rains have been adequate. May through October is the dry season and it is beautiful in its own way. 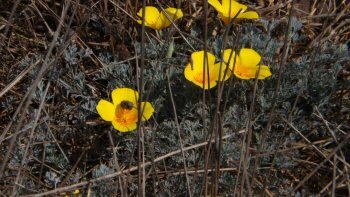 The flowers and plants that are native here have adapted to the dryness and if you look past the brown grasses, you will be rewarded with fine displays like these poppies which were blooming in late September. With a mile of shoreline and good wildlife corridors, you are likely to see a few of the many species which frequent the Ranch Preserve. There are plenty of birding opportunities here. Deer, coyote and perhaps a bobcat will show themselves. 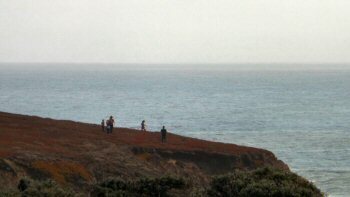 During the whale migrations (see my whale watching page) the marine terrace trail offers an excellent vantage point. On the bluff trail, you might be able to see otters resting and feeding amidst the kelp. I grew up in Southern California and always loved passing through the large undeveloped area of the Camp Pendleton Marine Base on the coast. It was really the only way to see what California had been like long ago. But it wasn't accessible and you could only look as you zoomed by on the freeway. Central California is so very blessed to have many places like the Fiscalini Ranch Preserve that have been set aside for the use and enjoyment of all and give us a sense of what the area was like long ago. Now, you may have already been through Central Californi and have a great vacation photo and a story to go along with it. Did you know that you can share that with everyone here by simply clicking on this link? It will take you to a page where you can tell your great travel story, upload as many as four photos and you're done! It's really easy and fun to see your page published!